I was lucky enough to take The Art of Diorama, a class which is only offered once a year and to a very limited amount of students. Led by American Museum of Natural History (AMNH) exhibition specialist Tom Doncourt, he is an expert on dioramas and how they are put together, preserved, and how they have changed over time with new materials and technology. I was fascinated by the fact that we really were in the museum alone at night after hours, free to roam thru these amazing halls and truly one of the most amazing places on earth, and really look up close at how these dioramas were built and how the elements were needed to complete these very complex pieces of history, encased in glass. I had the chance to speak with Tom Doncourt about his work and more. Tell me about your work at the museum when you started? I started out working in an early incarnation of the Discovery Room, a hands on facility for children run by the AMNH education department. When Ann Prewitt, the manager of the room, found out I was good at building things, we started designing all sorts of interactive projects for the kids. My work there really helped me understand how the exhibits in the Museum worked as educational tools. This is especially true of the dioramas. I was hired to build models for the Structures & Culture Moveable Museum and this required that I have a working space in the Exhibition department. When that was finished, Exhibition offered me a position. We also began investigating the condition of the Akeley Hall of African Mammals and that required us entering into the individual “scenes” and eventually pulling off the glass. I don’t think anything like that had been done for many decades and for someone who was interested in the art form, it was a fantastic opportunity. Shortly after that, we began renovating the Hall of Ocean Life and I got to build a few of the exhibits on the mezzanine. They were actually more “life-groups” than actual dioramas but the technologies were the same. A lot of experience crammed into a few years! Why are dioramas so important? I think the initial purpose of the dioramas still stands; to show the public the beauty of an environment as an integrated whole. Each diorama is a moment frozen in time at a specific site. They were intended as a warning against extinction and in quite a few cases a sad, calculated prediction of it. Many of the animals represented are now gone or endangered and the places they dwelt are now developed. At some point in time the Museum may be the only place anyone will be able to see them. On another level, they are time capsules preserving an age of exploration and a way of thinking that is worthy of dialogue and is history in and of itself. It is very unlikely that the effort and expense put into creating this form of exhibit will ever be repeated and so..they must be considered treasures. The Museum is also a museum of museumology and I think it is important to preserve the exhibition techniques and perspectives that were held in the generations before us. How does Theodore Roosevelt fit into the history of the museum? Roosevelt was, in many ways , the living embodiment of AMNH. It was a priority to open the outside world to the public, to educate Americans to the outdoors and to the observation of Nature, to explore and share the results. His father was one of the founding trustees of the AMNH and some have suggested that it was their hope that the museum would get Teddy’s taxidermy out of their home. There are at least a few pelts in the Mammalogy collection that were donated by T.R., I know that he was responsible for a Colobus monkey group and that he accompanied Akeley on a collecting expedition for the Elephant group. Our very earliest diorama groups in North American Birds inspired Roosevelt to create Nationally protected bird preserves, saving vast populations from extinction at the hands of the milliner trade. After his death, his bequests made it possible for the building housing the Akeley African and North American Mammal Halls to be built. What’s the most interesting anecdote you have about your restoration work with these dioramas over the years? I have many, but my favorite has to do with accessing the dioramas in the Akeley gallery for the first time. It was late on a Friday and Tory, my colleague, and I were asked to place air test kits in each of the exhibits in the Hall. We donned our Ghost Buster tyveks and headed forth. There are these big bronze doors that let you in behind the gallery and Steve Quinn had the key. It was dark and creepy in there and very few people had been given access over many years. We had to climb a ladder and walk a catwalk that took us above the displays and try and figure out how to get into each one to place a packet that would tell our conservators what chemicals were in the air in each case. I remember lowering myself down a hatch that took me behind a tree in the Mountain Gorilla Group. Your perspective of the space changes dramatically and you realize how huge the dimensions of each display really are. We finished placing the packets and headed back for the door. It was locked!! Mysteriously locked and we couldn’t get out. Friday night close to closing time. Many thoughts ran through my mind. Finally I resolved to write a note on a piece of paper I found and slide it under the door, shaking it till someone saw it. That actually worked, but it took security an hour to find a key and let us out. How did that door get locked anyway? The American Museum of Natural History should be called the 11th wonder of the world. Why is it such a special place? When I first experienced the Museum at the age of four, I was overwhelmed not only by the exhibits but by the sheer size of the space. Many of us live in crowded places surrounded by similitude. So, to walk into the huge spaces of AMNH and witness things great and strange and maybe a little scary, to get the sense that time can be stretched out into thousands, millions, billions of years…that is very special. A place where the richest most powerful people of New York City share the treasures of the world with anyone who cares to come in. A place where the greatest work of the greatest scientific minds in the world is illustrated for the common person…that’s very special. The museum has inspired me all my long life and has given me a place to expand my craft AND teach it to others. I still have the initial impressions of my first visit inscribed in my memory and the Museum is one of the only truly magic places I know. Explain how Dioramas made their way into the museum and when? It seems that by the turn of the 20th century, the ideas for dioramas or life groups were beginning to appear spontaneously in lots of places. As taxonomy became more developed, it would be obvious to tie animals together with their environments and iron beams in architecture could provide the large halls necessary to do this. When ornithologist Frank Chapman was hired by the Museum in 1888 to collect birds for life groups, it started a process that would lead to our first true dioramas. The President of AMNH, Morris Ketchum Jesup, had visited the London Museum of Natural History and seen taxidermied birds displayed in the branches of the actual trees in which they would be found in nature. He considered that to be a groundbreaking idea and wanted it for AMNH. As Chapman went about collecting specimens for a North American bird hall, he came to realize that populations of many plumed species were dropping off dramatically. He soon drew the conclusion that birds like egrets and flamingos were nearing extinction because their feathers were used in the making of fancy hats that were a huge fad. It became his mission to educate the public using the most vivid methods available to him. He tasked illustrators from the Ornithology department to create murals of the environs as backdrops and had museum preparators create realistic foregrounds to which he mounted his taxidermied specimens. The results were lifelike dioramas. The date was 1903 and museum goers had never seen the like. The public flocked to them and the exhibits popularity gave Chapman a platform to tell the back story–that man can cause the extinction of animals–to the newspapers. 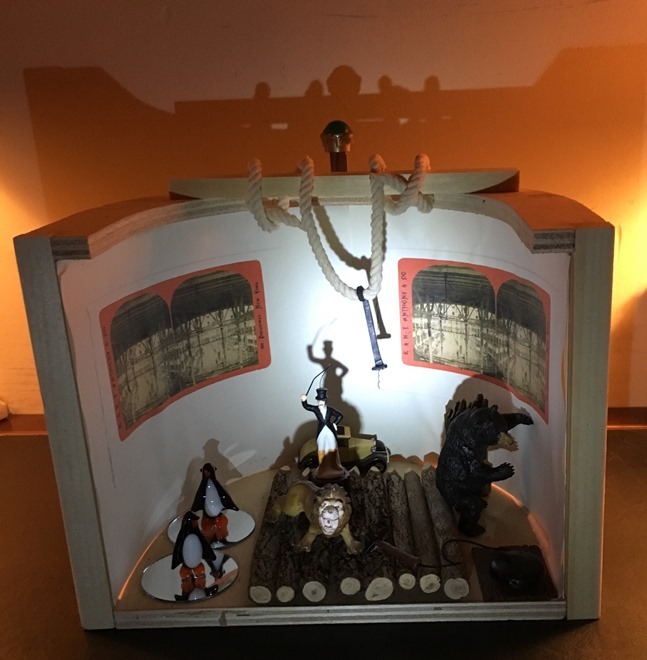 Dioramas were created as an act of conservation! Which is your favorite diorama at the museum and why? I would have to say that the Mountain Gorilla group is my favorite. There are several reasons. It represents one of the first times western civilization encountered this species first hand. The story behind it is very tragic as the famous inventor, taxidermist and explorer Carl Akeley had a terrible bout of conscience after killing his first gorilla and then died on his return to finish the collecting of specimens. The scene painted by William R.Leigh is breathtaking with Mt. Mikena in the background.The blackberry plants and trees finish the beautiful composition. It must have been a paradise up there. I have looked at that diorama almost everyday in my 25 years at AMNH and it never fails to transport me to that faraway place. Seeing the volcano and the panorama stretching out for, what seems like miles in the distance, always brings to mind those fantasy movies I grew up with—The Lost World and King Kong! For more information on the diorama exhibitions at the American Museum of Natural History and more, please visit https://www.amnh.org/.